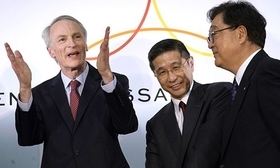 Jean-Dominique Senard, left, seen with Nissan CEO Hiroto Saikawa and Mitsubishi CEO Osamu Masuko. In a radio interview, Senard said: "There is no desire to dominate [the Renault-Nissan-Mitsubishi alliance]. We need a blank slate." PARIS — Renault Chairman Jean-Dominique Senard said the alliance with Nissan and Mitsubishi Motors needs to be rebalanced "in spirit" to counter fears among the Japanese carmakers that he wants to dominate the decades-old partnership. "There was a lot of worry at the start, and I can understand that, about whether Jean-Dominique Senard was going to be dominant, would want to impose his views," Senard said Monday in an interview on RTL radio. "There is no desire to dominate. We need a blank slate." The lopsided cross-shareholding between Renault and Nissan "doesn't reflect the reality" of their relations and the alliance's new governance is working well, he said. A better framework has helped overcome "forces" that were trying to break the partnership apart. Senard replaced Carlos Ghosn in January at the head of Renault and has been working to keep the partnership together ever since. Ghosn led all three companies at the same time until his arrest in November in Tokyo on charges of financial misconduct and his departure left the alliance reeling from a climate of suspicion. Japanese authorities are now questioning Ghosn over new allegations that he funneled millions of dollars from Nissan for his own purposes. He has denied all charges. Ghosn's removal laid bare tensions within the Alliance stemming from Renault holding a 43 percent stake in Nissan with voting rights, while the Japanese carmaker holds a 15 percent in Renault stake without voting rights. Nissan has also been uncomfortable with the French government's influence via a 15 percent stake in Renault that carry extra voting rights. Senard said Japanese culture dictates that legitimacy comes from not imposing views, equal treatment and the desire not to humiliate. "We need to know how to treat them as equals," he said. "The feeling was this wasn't done in the past." The French executive said an audit of RNBV, an Amsterdam company running the Alliance, isn't yet complete. Renault said earlier this month that Ghosn had made questionable payments to a distributor in the Middle East and an outside lawyer. That probably triggered Ghosn's latest arrest, according to his lawyer.